On Wednesday, nine officers from France's elite police units were cast as terrorists for the purpose of a training exercise that was staged at Montparnasse train station, in the southwest of Paris. Officers entered the station in the early hours of Wednesday, armed with guns and mock suicide vests. Officers from the Anti-Crime Brigade (BAC) were the first to arrive on the scene, successfully neutralizing one of the terrorists, in a scene that bore some resemblance to the November 13 Bataclan concert hall attack, in which a BAC officer shot one of the attackers before awaiting backup. After pretending to fire onto a crowd played by officers in training, the fake terrorists split up into two teams. One of the units holed up inside the station building with several hostages, while the other boarded trains that were stationed on the platform, taking passengers hostage inside the cars. This part of the exercise was reminiscent of the foiled terror attack on board a high-speed train on its way to Paris from Amsterdam in August 2015. 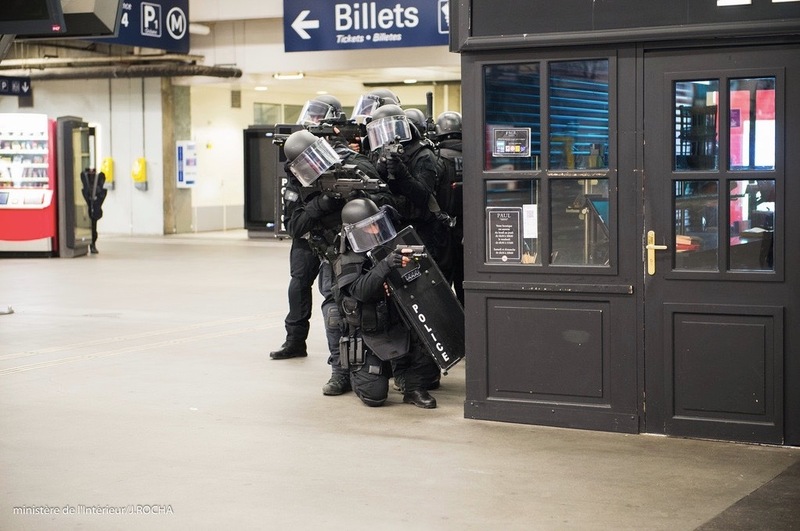 As part of the simulated exercise, officers from France's three elite police units then launched simultaneous raids at the various attack sites in the station. The exercise, which was overseen by French Interior Minister Bernard Cazeneuve, ended around 2am. More than just a training exercise, the simulated terror attack was an opportunity for the government to test out its new plan to improve coordination across France's various elite intervention squads. Last year's attacks highlighted the tensions that exist between the country's elite forces, as well as the lack of coordination during sensitive operations. In situations where every single minute counts, historic rivalries between these forces could have dire consequences. Back in October 2015, just two weeks before the November 13 attacks that killed 130 people in and around Paris, Cazeneuve had called for better cooperation between the various forces. He repeated his call for tighter collaboration in February, when he unveiled major equipment and weapons upgrades for French cops. Unveiling the government's new response strategy Tuesday, Cazeneuve said that emergencies like terror attacks, hostage situations or large-scale shootings would now be managed by the first unit to reach the scene. This new strategy overrides the previous divisions of operations, which saw the police overseeing security in the cities, while the gendarmes — a military police force — handled rural areas. From now on, for example, the Gendarmerie's National Intervention Group (GIGN) — one of the country's three main elite units — will be invited to intervene in the capital. As well as the geographical divisions, certain areas of security are subject to specific agreements between the authorities and the various forces. The security of nuclear sites, for example, has been overseen by the Gendarmerie since 2009. "Faced with enemies who are determined to attack us while causing the most damage possible, with no desire to negotiate... we need effective forces," Cazeneuve told representatives from the three branches on Tuesday. "Now is not the time for forces to compete with one another, now is the time for unity." The agency in charge of keeping the peace between the various units — the Intervention Forces Coordination Unit (UCoFI) — has drawn up a list of each unit's unique skillset, which will be used to determine which group should intervene in various situations. "The security of France simply depends on it," said Cazeneuve, after explaining that the new divisions of operations would allow each unit "to become more efficient in its areas of competence or excellence." Right now, each of the three elite police units has a specific mandate. Launched in 1964, the Research and Intervention Brigade (BRI) is the oldest of the three branches. It answers directly to the Judicial Police (PJ) — the criminal investigation unit of the French police. The BRI's role is to investigate crimes and monitor individuals. The unit, which has around 15 branches across the country, can also carry out raids. In January 2015, officers from the BRI entered the kosher supermarket in Paris where gunman Amedy Coulibaly was holding hostages. They also broke the Bataclan siege on November 13, 2015. The BRI currently has 100 officers — a number that Cazeneuve has pledged to double in the coming months. The GIGN was launched in the 70s. It was made famous by the 1976 Lyada hostage rescue mission, when its snipers were able to kill a group that had taken a school bus of French children hostage near Djibouti, in east Africa. That same year, a French television crew filmed GIGN officers training. Over the years, the GIGN's missions have focused on the security of the French president and the security of French diplomats abroad, plane hijackings, and chemical attacks. The GIGN can also be asked to assist with arrests, particularly when suspects are considered armed and dangerous. The youngest unit is the Research, Assistance, Intervention, and Deterrence unit, also known as the RAID. Launched in 1985 with the mission "To Serve Without Fail," the unit currently has 400 officers. Its brief is similar to that of the GIGN, but with a focus on major cities. While the RAID is often mobilized in the event of a terror attack or a major criminal attack, it is also in charge of security at major sporting and cultural events. Cazeneuve has also promised to open new branches of the RAID, as part of the plan to bolster security in the country. Speaking to French radio station on Wednesday, French Prime Minister Manuel Valls also confirmed that the government would seek to extend the state of emergency to June and July, when France will host the UEFA Euro 2016 soccer championship and the Tour de France bicycle race.